This nature craft is a great addition to a nautical decor, but it also makes a wonderful homemade gift for a man on Father’s Day or at Christmas. If you don’t live near a beach, invest in some seashells and sand from a craft store or dollar store. 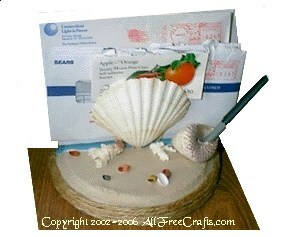 Even if you have to buy the shells, this craft is still relatively inexpensive to make. 2 scallop shells – we got ours from eating stuffed clams (yummy!) but they are also available at the craft store, fish market or even, sometimes, at the pet store. Murex shell and assorted tiny shells. These are often available in a bag of mixed shells at the dollar store. 1. Mix equal parts white glue and sand and spread this mixture on one half of the wooden plaque with a popsicle stick. If the mixture seems a little thin, add a little more sand. Let this wooden base dry on a piece of a waxed paper. 2. Next, paint the other half of the wood with the blue paint and go right up to the sand. Let dry. Paint a white edge where the “water” meets the sand, and put a few white squiggles on the blue to represent waves and whitecaps. 3. Spray or brush on a sealer and let this dry. 4. Mix the two parts of some epoxy glue and use this to glue in place the two large scallop shells. These should be placed in the center of the seascape, and stand open wide enough to hold some letters. You may need to prop them up with something until the glue dries, which should only take about five minutes. 5. Use the epoxy again to glue on a murex shell, or any shell that will work to hold a pen. You should also glue on the tiny shells at this point, in any arrangement that you find pleasing. 6. Glue a few loops of twine around the bottom of the wooden plaque. 7. Finally, cut some felt to fit the bottom and glue in place. Your seaside mail organizer is now ready to put on your desk in the office – or to give to the man in your life!